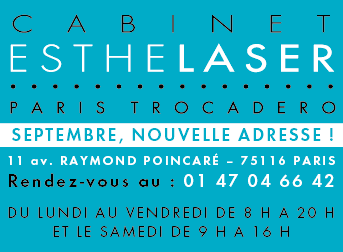 English speakers are welcome at the offices of ESTHELASER Paris Trocadéro. Laser hair removal is a very efficient method to remove unwanted hair and ingrown hairs. Laser hair removal is a medical procedure performed at Cabinet ESTHELASER by physicians certified and experienced in medico-esthetic lasers. At the offices of ESTHELASER we use last generation class IV lasers Cynosure (Alexandrite and Nd-YAG,) with air cooling device. HOW DOES IT WORK ? Laser technology uses beams of highly concentrated light targeting the pigment (melanin) to destroy the hair follicles. It is a simple, precise and secure technology. Results are permanent after several sessions (depending on area, sexe, age ; usually 5 to 7 sessions). Best results are observed for people with dark hair and light skin. Laser hair removal is available for light skins (Alexandrite laser) and black skins (Nd-YAG laser). Laser hair removal is available for both women and men. Any area can be treated (except eyebrows due to the possibility of eye injury). Commin areas for laser : face, upperlip, chin, neck, bear bikini, legs, underarm, arm, hands, back, bottom… Some areas have higher levels of risk. Risk/benefit are thoroughly duscussed with potential clients. DOES IT HURTS ? The sensation is often described as a snapping feeling that lasts for only a fraction of a second. You may feel warmth or a tingling sensation for a short time afterward. Redness, swelling and skin discomfort disappear in a few hours. Most people tolerate the treatment without any topical anesthetic. Topical anesthesic application can be prescribed in case of major discomfort. WHAT ARE THE RISKS ? Pigment changes (hyper ou hypopigmentation) can occur in dark skin. Laser hair removal can cause blistering, crusting or other changes in skin texture in rare cases. HOW TO PREPARE THE FIRST CONSULTATION ? Limit plucking and waxing for 4 to 6 weeks before treatment (shaving is possible but hair must stay visible). Avoid sun or UV exposure for 6 weeks before treatment. You should not be tanned. Laser can not performed in pregnant women.